Prototype Interdynamic MP9 submachine gun This is the select-fire SMG that started it all, in reference to the KG-99 and TEC-9`s semi auto pistols that followed. Intratec AB-10, a "post-ban" (post-1994) reincarnation of the Intratec TEC-9 pistol, shown without magazine. The major differences from "pre-1994" TEC-9 pistol are un-shrouded and un-thread barrel, and different markings; the basic design is the same. The Intratec TEC DC-9 "assault pistol", also known as DC-9, TEC-9, or, if manufactured after 1994, as AB-10, bears the dubious distinction of being one of the most widely used "criminal" guns in USA. It was used in several mass murder cases, as well as in unknown, but definitely large number of street fights and other violent crimes. TEC-9 became "famous" for its "evil" appearance, large magazine capacity (which offered significant firepower), and for low price. Unsurprisingly, these features made TEC-9 very popular among various marginal types. For any serious or professional shooter this gun vas of little value - it was too big and heavy to be carried comfortably, it was too unreliable when firing anything but FMJ ammunition, and the accuracy with very crude fixed sights was about marginal. The TEC-9 design was started in Sweden, when the Interdynamic AB company of Stockholm developed a relatively simple submachine gun. Since Sweden was a poor market for such product, a subsidiary company Interdynamic was established in Miami (Florida, USA), to market Interdynamic guns in USA. As the full-automatic weapons market in USA is very restrictive, the basic submachine gun was converted in semi-automatic only variant, apparently suitable for civilian US market. This semi-automatic pistol, like its submachine gun predecessor, was a simple blowback design, firing from the open bolt. It was designated Interdynamic KG-9. But, sooner than later, US Bureau of Alcohol, Tobacco and Firearms (BATF) found that this semiautomatic pistol can be easily converted back to full automatic, and restricted it manufacture. Interdynamic redesigned the KG-9 into "closed bolt" design by adding the separate striker, and designated it KG-99. About the same time (mid-1980s) the Interdynamic of USA turned into Intratec Firearms, Inc, based in the same city of Miami (Florida). 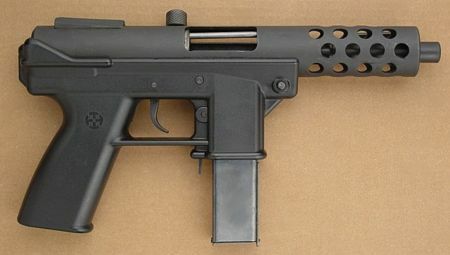 Intratec initially produced the KG-99 under the designation of TEC-9, but about 1989 renamed it into DC-9. With the introduction of the infamous US Assault Weapons Ban in 1994 the Intratec pistols were prohibited for manufacture (but not for ownership, if made before the ban). Intratec subsequently slightly redesigned the basic design, dropping some "assault" features like the threaded barrel, barrel shroud, and forward pistol grip. In this "post-ban" version the pistol was manufactured and sold as AB-10 (AB stands for After Ban). The AB-10 pistols were sold with 10-round magazines, but still could accept both factory and aftermarket high capacity magazines from its predecessors, TEC-9 and DC-9. There were several manufacturers in US, who made copies of DC-9, such as AA Arms, which produced DC-9 look-alike AP-9 pistols. Like originals, AP-9 pistols were of cheap construction and marginal reliability. The Interdynamics and Intratec pistols are blowback operated, semi-automatic weapons. The major difference between Interdynamic KG-9 and Intratec TEC-9/AB-10 line of pistols is that KG-9 fired from the open bolt, and had a fixed firing pin; the Intratec pistols fire from closed bolt, and have a separate firing pin and a massive striker, which interoperates with the sear. The receivers of all versions are made from steel tube (either carbon or stainless), the frames (or "lower receivers") are made from polymer, integral with pistol grip and magazine housing ahead of the trigger guard. The tubular receiver is hinged to the front of the frame. There is no manual safety. The open-bolt Interdynamic KG-9 pistols featured a special cut, in which the charging handle can be locked when bolt in retracted. The KG-99 and Interdynamic pistols have manual safety built into charging handle - to lock the bolt, one must push the charging handle inward. All pistols are fed from double stack, detachable box magazines; standard magazine capacity was 20 or 32 rounds for pre-ban guns, and 10 rounds for post-ban guns. After-market magazines were offered in various capacities up to 50 rounds. Permanently fixed open sights were not adjustable, and often misaligned. In the pre-ban TEC-9 and DC-9 versions these pistol accepted screw-on barrel extensions, which had purely cosmetic purposes, or silencers (which were illegal in many jurisdictions).